Tyvek is a product manufactured by DuPont. It is a protective air and vapor barriers normally used for residential especially in the basement area or on the outside of your house underneath all finished exterior. It is designed to protect the area that you have installed with Tyvek from water, wind and any other weather elements. 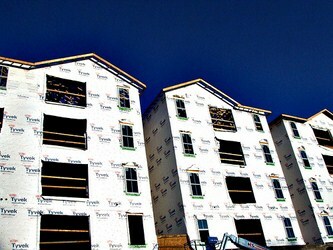 Tyvek also protect your house’s wood framing from moisture and air penetration. It is common among contractors or even a do-it-yourself house owner to install the Tyvek barriers behind drywall if it is used for interior applications and the effectiveness of installing Tyvek on finished walls depends on the attention to detail of the person who installs it. Although it is consider easy to install, the task needed you to plan accordingly before you start to finish your basement walls. The first thing that you need to do is to remove the dry wall away from the finished basement walls just by using punching holes in it with the help of a hammer. Then, you can pry them off using your bare hands. You do not have to remove the ceiling drywall. Next step that you have to do is to roll out the sheet of Tyvek along the wall of your basement. Make sure that you proceed with the cutting of barrier to the length that you have measured earlier using a utility knife. By using Tyvek, it can help you to increase your home insulation and also reduces the cost and usage of energy. It also protects your finished basement caused by water damage due to hydrostatic pressure via the cinder block walls. Make sure that you hold the barrier to the top corner of your wall. Then, you have to secure the top of the barrier right up to the top framing by using staples along with the entire wall. Whenever you want to build the frame of your basement walls in sections which are easier to handle on the ground and then you could lift them into place instead of trying to install the studs vertically. Apart from that, you would be able to save time and also ensured that the frame is installed very well enough for protection against weather elements. Then, you have to fasten the whole sheet onto the exterior wall using staples approximately every foot on every wood framing. The above step need to be process until your entire exterior is covered by Tyvek. Ensure that you create an overlap of joints in between sections that ranges from 6 up to 8 inches. Always ensure that you apply the vapor barrier tape along joints the two sections of the barrier. Seal the joints securedly because if it is not, the barrier would not be able to act as an air barrier. If you notice there are excess of the Tyvek, you should trim off the excess Tyvek from the top and bottom by using a utility knife. Ensure that you cut the Tyvek close enough to your basement floor and near the top of your ceiling. You should always wear safety glasses and hand gloves for protection especially when you are removing the drywall. You need to repair any water leaks found in your basement area before you start to install the Tyvek or installing insulation. If water tends to create problems, you need to consider using cement board instead of using drywall.